This page is a summary of Investments to End Poverty Chapter 6. Poverty estimates are continually revised as new methods for measuring poverty emerge. This affects poverty trends, and we now know that there are more people in poverty than previously thought, calling into question the robustness of previous research on poverty. Poverty estimates currently draw on five data sources: household surveys administered by national statistical agencies; population censuses; national accounts; consumer price indexes and the International Comparison Program. These sources are often unreliable and difficult to compare, meaning calculations are often built on weak assumptions. PPP is used to compare consumption in countries by converting local currencies into a comparable dollar value. Its reliability is questionable because few things are consumed by everyone everywhere. For example, it is difficult to adjust relative prices for services such as education and health; while rural prices are neglected in many countries’ PPPs. Measuring income: some surveys focus on household income rather than household consumption as a poverty measure. Income is more volatile and harder to measure. Number of consumption items: different surveys list different purchased products to measure consumption, leading to varying estimates of poverty. Non-food items: some surveys exclude non-food items and focus on food purchasing. This lowers consumption estimates, and produces higher poverty rates. Relying on recall: most surveys are based on what households can recall purchasing. Where long time periods are used, there is a risk of underreporting as families cannot remember. Seasonality: consumption patterns vary throughout the year, but few surveys capture this, possibly distorting results. Relying on a single household member: this may result in underreporting because usually more than one family member buys the products. Hence household surveys often overstate poverty levels. Consumption estimates measured by household surveys and a country’s national accounts vary widely. The International Monetary Fund benchmark for satisfactory statistical governance is to conduct a survey every five years, but this is largely not met in low income countries because of limited resources, capacity and weak governance. We tend to know less about numbers of people in poverty in countries where poverty is most acute. Survey frequency varies across regions – the least frequent are in sub-Saharan Africa and the most frequent are in Latin America. 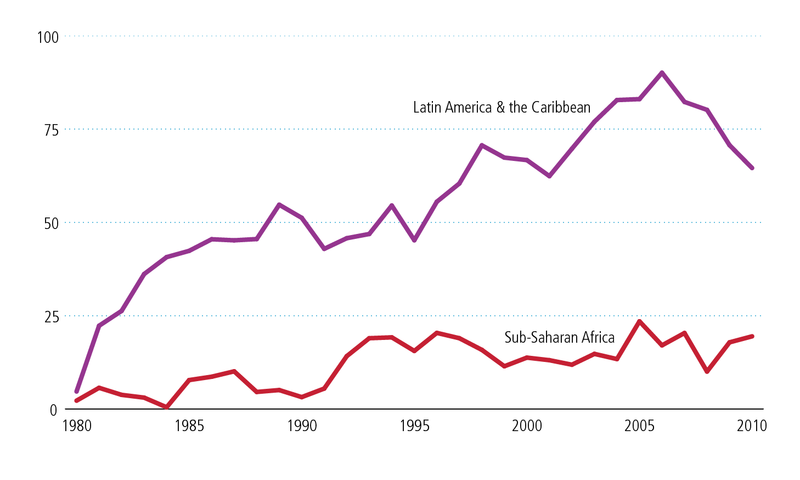 A quarter of the estimated numbers of people in poverty in sub-Saharan Africa are from surveys conducted before 2005. Source: Based on data from World Bank PovcalNet (see methodology). Low capacity: government statistical agencies in many developing countries suffer from acute capacity constraints, reducing the quality and frequency of surveys. Limited resources: a typical cross-sectional survey costs US$1–2 million, a significant sum in the budget of low-income countries. Only 0.3% of total aid commitments support statistical systems in developing countries. Institutional constraints: government statistical agencies often have limited status and influence, and struggle to keep high-quality technical staff. Coordination failures: survey designs are not standardised and assistance for statistical development is concentrated on a number of developing countries. The data available does not provide a clear breakdown of the different forms of aid delivered to developing countries, where the aid is allocated and who delivers it. Data on wider resource flows – such as domestic spending, remittances, and private development assistance – lacks detail. The lack of standardised data sources and metadata makes it difficult to distinguish between and compare flows and increases the risks of double-counting. Better data is critical for assessing the prevalence and location of poverty. It can inform decision making for optimally allocating and tracking resources, help monitor the effectiveness of investments and empower people in developing countries to demand accountability. Improve current and new methodologies for measuring poverty: survey design should be harmonised to enable better comparability. ‘Real-time’ poverty estimates should be published regularly to inform decision-making, and the World Bank should update its global poverty estimates each year. Donors should allocate a greater proportion of their aid budget to supporting statistical systems and capability in developing countries. New approaches such as crowd-sourced data should also be utilised. Disaggregate data on poverty and resource flows: data should be disaggregated at the sub-national level and surveys on poverty should go beyond the household to be more representative, capturing information at the individual level and from a wide range of groups. Donors should provide detail in their reporting on ODA to include the form of aid; where it is allocated; and who delivers it. Systems for reporting on wider resource flows to developing countries should also be strengthened.